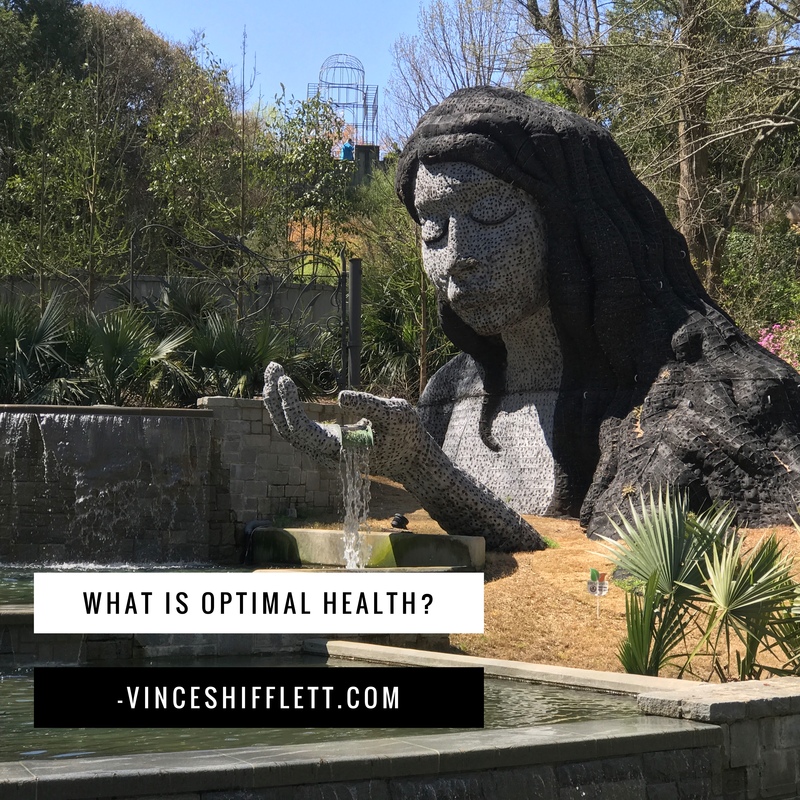 What is optimal health? Health gurus have used many words to define optimal health. Since the inception of my blog, I have talked a lot about this subject. In this article, I would like to sum up my thoughts on optimal health. In addition, I would also like to share my personal definition of optimal health with you. When I think of optimal health, I think of what I believe to be the 3 dimensions of optimal health. They are the physical dimension, mental dimension, and spiritual dimension. I sometimes think of it as my house and the different rooms in my house. I have found it important to spend time in each room. Personal Definition of Optimal Health: Functioning at your highest level in all dimensions of optimal health. In other words, being your highest self in all dimensions. Being your best self physically, mentally, and spiritually. In my analogy of the house, if you had a room you never went in, that room may become dusty with spider webs in the corners. The air would perhaps become stagnant and not pleasant to breathe. Whereas if you spent time and energy in that room, it could be an enjoyable place to spend time. I also like to use the analogy of my car. If just one of my tires is off-balance it can be a bumpy ride. It is important to take care of all 4 tires for a smooth ride. Going to the gym or spending regular time exercising the physical body is essential for optimal health physically however it does not take the place of spending time with your spiritual practice to nourish the spiritual dimension of one’s health. One can be in great shape physically with tons of muscle mass and still feel void in their spirit. Therefore, being connected to spirit is also essential for optimal health. There are many avenues people use to connect with spirit. It is about developing a spiritual practice that works for you. One size does not fit all. For me personally, I found spiritual practice goes way beyond gathering in a building every Sunday morning. As a matter of fact, that gathering has proven to be more of a distraction for me. The shows, the clothes, the performances, and the constant talk about money and membership led me to seek a different path for my personal spiritual practice. Meditation and prayer have been great ways for me to connect with my spirit but do what works for you. We’ve all had that void feeling at some point in our life therefore we know when we are connected as opposed to being disconnected. Last but certainly not least is the mental dimension of our health. For me, this means simply being fully conscious and aware of our thoughts. Control your thoughts or they will surely control you. I have also discovered that my thoughts are directly related to how I feel physically. You may have heard it called the mind/body connection. It takes a constant mental awareness for me to take control of the incessant mental chatter that goes on in my head. With every thought, I’ve learned the importance of asking myself, “Is it true?” Is that thought true. Guess what? 95% of the thoughts go in file thirteen under the fake news category. Once you learn exactly who you are and what your purpose is on this planet, you realize the mental chatter is pretty much nonsense. As with physical and spiritual, if the mental health is out of whack, it throws the physical and spiritual off. They all work synergistically with one another just as the tires on our car work synergistically with one another to get us from point A to point B. You can’t get there on just 3 tires. You need all 4. If you have flat tire, you end up on the side of the road stranded. If your physical, mental, or spiritual well-being is out of alignment, you will end up stranded. In conclusion, spend time in each room of your house. Take care of your body physically with regular consistent exercise. Nourish your spiritual being with regular spiritual practice. Spend time in silence allowing the mental chatter to calm down a bit. Spend quality time with each dimension of your health. They are all equally important for optimal health and subsequent happiness. Be whole physically, mentally, and spiritually. Vince is a Critical Care Registered Nurse and Published Writer living and loving in Atlanta, Georgia. He uses his 30 years of nursing experience, along with his 56 years of life experience to share with us biweekly. Enter your email address to receive his bi-weekly educational, inspirational, and thought provoking work straight to your inbox. You can also follow him on Facebook, Instagram, LinkedIn and Twitter. Your support is deeply appreciated. Thank you. I am so grateful for your love and support. Excellent post Vince. During my nursing training in the 1980’s we were taught Holistic Nursing The four dimensions 1. Physical. 2. Emotional/Mental. 3. Spiritual . 4. Social. I had forgotten about that training in nursing school. Thank you so much for that feedback. I love the four dimensions that the training taught us. Always appreciate you and your feedback. Yet another fascinating blog, Vince. Like you, I enjoy going to church but dislike the clothes parade, gossipping or back biting that goes on therein. For me, God is within me, so I don’t need to go to church and be seen. I love the analogy of the rooms and the car. Really very true points. Thanks as always to you. Always love your perspective and your beautiful soul. Great reminder Vince to take time to care for self and how important it is to do so! Thank you Tammy. Really appreciate the support. I love it! Vince so proud if you. So glad you liked the article. Thanks as always for your love and support.